Lipton Brisk canned and bottled iced tea is one of the oldest brands of RTD teas around. It has a surprisingly low amount of caffeine, but this is probably due to the use of instant tea powder instead of Lipton Brewed Tea as an ingredient. Caffeine in other flavor varies depending on how much instant tea was used in the formulation, but all are quite low in caffeine. 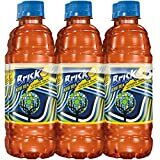 Lipton Brisk Tea beverages come in 12, 20, and 24 fluid ounce size cans and bottles. Lipton has begun exploring new markets around the world were drinking iced tea isn't common and thus introducing Lipton Brisk Tea. Sugar content: 20 grams (per 12 ounces). 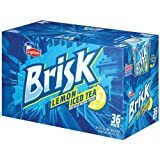 How Does Lipton Brisk Tea Compare? 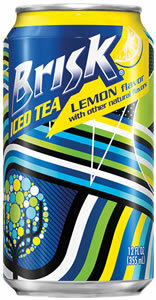 Lipton Brisk Tea contains 0.67 mgs of caffeine per fluid ounce (2.25mg/100 ml).